Private Studio with Sleeping Alcove, Efficiency Kitchen & More! Yorba GQ is a separate apartment attached to the main house. In your own private studio you have an efficiency kitchen complete with wet-bar, refrigerator, toaster, microwave, range and coffee maker. The pub style dining set seats four. Your private bath has a walk-in tiled shower, toilet, and sink. There's a separate sleeping alcove with queen size bed across from a walk-in closet with plenty of space for clothing and other gear. Access to the washer & dryer and off-street parking for one car is included. Outside you can relax on your private patio with table and chairs. The fire pit, gas grill and pool are shared with your hosts. The mountain views by day and the star studded night sky create a peaceful setting. The house is located just 1.5 miles from the center of Palm Springs in the Racquet Club West enclave. We're just a "stone's throw" from the Aerial Tramway entrance and 2 blocks from Route 111 that connects the resort cities of the Coachella Valley. There's some restaurants, bars, and shops nearby including Loco Charlie's our favorite Mexican place. The Desert Medical Center is within a mile. Day trips are easy to Joshua Tree National Park, the Salton Sea, and places beyond. Robert and Stephen are your hosts. They moved to Palm Springs in the spring of 2017. They relish 'la dolce vita' and appreciate others who prefer things quiet and mellow. Their two small dogs can be rascals so they hope you'll understand the occasional bark. They're happy to answer any questions or respond to your requests. Our property is listed on several vacation rental networks. We update all calendar as soon as we confirm a reservation. Unfortunately we are unable to hold open dates because of how the different networks operate. It is best not to delay in your decision making. We live in the Racquet Club West neighborhood on the north side of Palm Springs just a stone's throw from the Aerial Tramway entrance. Steve is the Designated Broker for a Seattle based real estate firm. Robert is retired and spends his time exploring the Coachella Valley. We have two small dogs and two big cats. Travel is always on our minds. We enjoy meeting people everywhere we go. 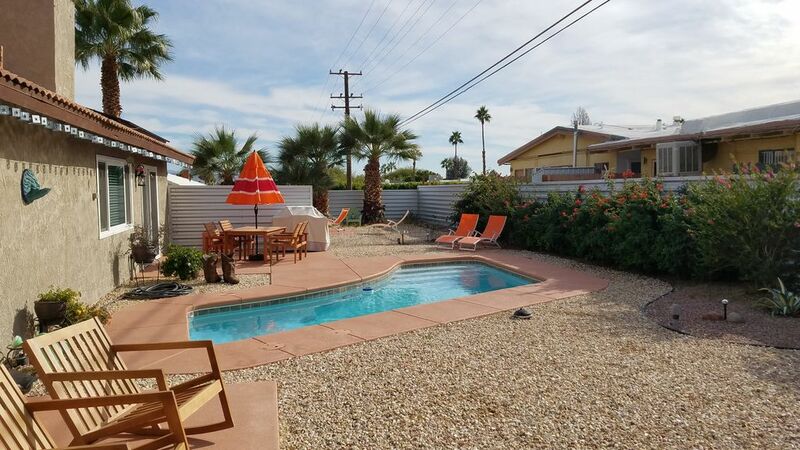 We're close enough to downtown to enjoy its shops, restaurants, and bars but far enough away to provide a quiet and relaxing respite under the desert sky. The studio is big enough for your comfort and enjoyment but maintains a cozy feel that's easy to tidy up. The pool and firepit give you some great outdoor options and the WiFi and TV provide you plenty of entertainment choices. Additional housekeeping services are available at guest's expense and must be requested when you make your reservation. Payment (cash only) is made directly to the cleaner on day of service. The proximity of nearby homes is not ideal for 'clothing optional' sunbathing. 3/4 tiled bath with walk-in shower, toilet, and sink. Don't miss Village Fest held on Palm Canyon Dr in the center of town every Thursday night from 7 to 9pm. Gaze upon Mt San Jacinto where the Palm Springs Aerial Tramway takes you up to the visitors lodge and restaurants located 8,000 feet above the desert. Salt, pepper, spices, sugar, Splenda, non-dairy creamer, ketchup, and mustard. Flat screen with complimentary access to Amazon Video Prime and access available to Netflix or similar apps by using your subscriptions. Available from 10am to 8pm. Shared with hosts. Heated by additional fee from November 1st to March 31st. Swim at own risk. Nice views of Mt San Jacinto. Close to restaurants, bars and other conveniences. Downtown Palm Springs is less than 2 miles away - a 5 minute car ride. fantastic hosts, very clean and comfortable casita. We enjoyed our stay so much we stayed an extra week! Thank you for your review and taking good care of our Guest Quarters "Casita." The place was spotless hardly had to do a thing before next guests arrived. Stephen and I enjoyed having you stay, and by check out day we felt more like friends than landlords. Best regards moving to your new home in sunny Palm Springs! This propert is beautiful, very close to the tramway and the downtown area, and the host was very welcoming and helpful. Thank you, we always appreciate our guest that choose to stay at Yorba GQ!